Fleximize has launched a new tool to help UK SMEs get the fairest deal on their business finance. 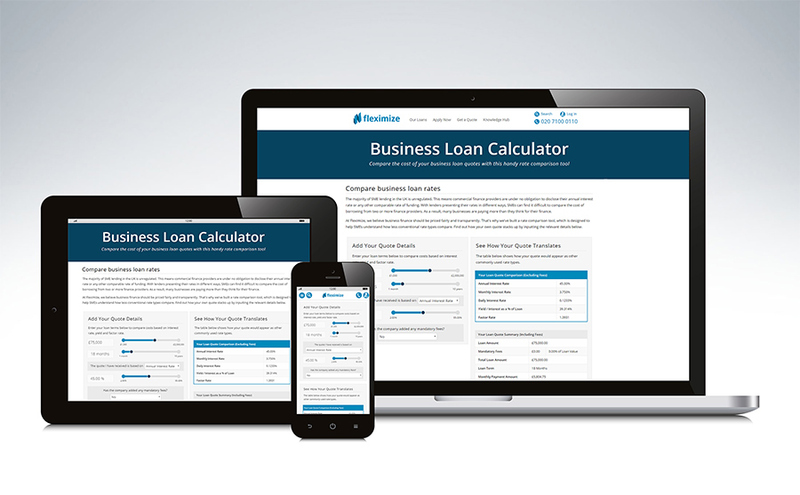 The company’s rate comparison tool allows businesses to instantly compare business loan quotes that are based on a range of different rates. Because the majority of SME lending in the UK is unregulated, commercial finance providers are not obliged to disclose their annual interest rate or any other comparable rate of funding. This lack of transparency means SMEs can find it difficult to compare the cost of borrowing from two or more finance providers, especially when they’ve presented their rates in different ways. Through its own research, Fleximize found that businesses are accepting quotes based on less conventional rate types – such as yield or factor rate – believing them to be cheaper than quotes based on a monthly interest rate. With factor rate being displayed as a decimal, typically ranging from 1.1 to 1.5, it can be easy for business owners to misconstrue it as a lower rate. However, the reality is that quotes based on unconventional rates can often be more expensive than those based on a standard interest rate. 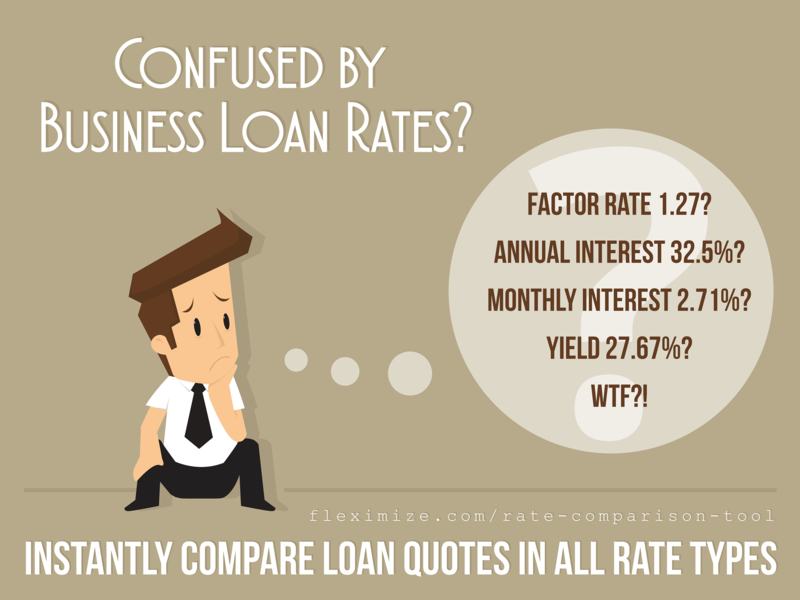 For example, using Fleximize’s rate comparison tool, a company could compare the cost of two quotes that are based on 18-month repayment terms. If the first quote is based on a factor rate of 1.35 and the second quote is based on a monthly interest rate of 3%, they’d discover that the first quote is equivalent to an interest rate of 3.37%, making it more expensive than the second quote. Fleximize’s rate comparison tool is built on a unique algorithm that was designed by the company’s finance and development teams. The tool allows business owners to enter the details of a business loan quote, including any mandatory fees, before instantly converting it into other rate types and displaying the total amount repayable. Because the tool calculates the cost of a business loan in real-time, it means business owners can discover how much they will be paying in a matter of seconds. The annual rate that is charged on a loan. Expressed as a percentage, it represents the actual yearly cost of funding over the term of the loan. Annual interest is calculated by multiplying the monthly rate charged on the loan by the number of payment periods in a year, e.g. annual interest rate = monthly rate x 12. Yield denotes the total interest paid in a year as a percentage of the loan amount. It can be calculated by dividing the total amount of interest paid in one year by the amount funded. For example, if £2,500 interest was paid on £10,000 worth of funding, the yield on that loan would be 25%. Rather than being expressed as a percentage, a factor rate is written as a decimal, typically ranging from 1.1 to 1.5. The total amount repayable is calculated by multiplying the loan amount by the factor rate. For example, if a business borrows £10,000 at a factor rate of 1.5, the total amount repayable will be £15,000. Fleximize is a UK-based direct funding company and web platform launched in January 2014. Our mission is to help small and medium-sized British businesses grow by providing them with flexible financing solutions tailored to their unique needs and preferences. We are striving to provide our clients with the experience and service traditionally available only to larger corporates. Our dedicated relationship managers will guide and support clients from the moment they apply – no bouncing from person to person or waiting for hours on hold. Fleximize also offers traditional fixed-term loans, which come with a range of flexible features including top-ups and repayment holidays.